NOAA Halts Whale Disentanglement Efforts After Rescuer Dies : The Two-Way Boat captain Joe Howlett died on Monday after freeing a right whale that was tangled in fishing gear in Canada's Gulf of St. Lawrence. Joe Howlett, an expert in rescuing whales from tangled fishing gear, died on Monday. He's seen here off the coast of Canada's Campobello Island in 2015. After a noted emergency responder died in rescuing an endangered right whale, the National Oceanic and Atmospheric Administration says it's suspending efforts to free whales that are similarly trapped by fishing lines and gear. News of the suspension comes as the whale rescue community mourns Joe Howlett, a Canadian who died during a rescue operation on Monday. 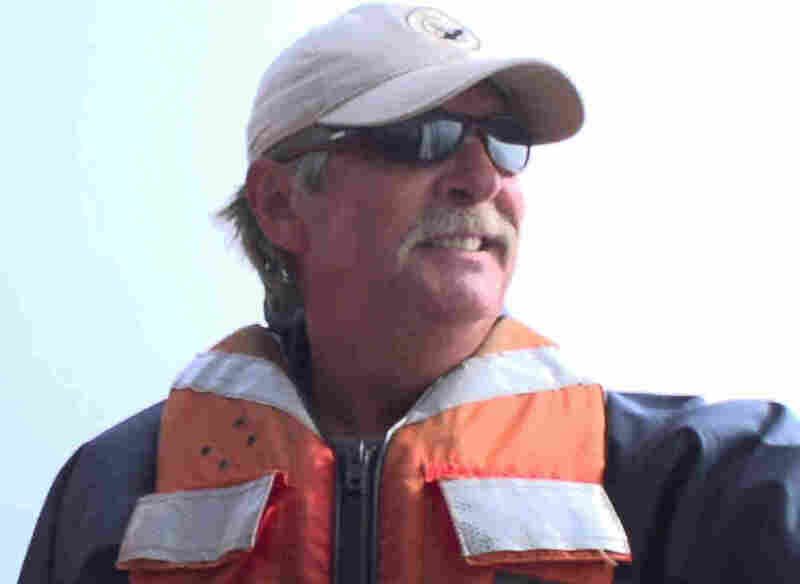 Howlett, a former fisherman and boat captain, had founded a whale rescue team and was based in Campobello Island, just across the border from Lubec, Maine. Howlett died after freeing a right whale in Canada's Gulf of St. Lawrence. At the time, he was aboard a fast response vessel and had just cut the whale loose — an operation that often involves using long poles with blades on the end to sever crab floats and fishing lines that have become wrapped around the large mammals. "His colleagues reported that he was struck by the animal as it sped away," Maine Public Radio reports. Howlett was considered an expert in his field. His death is believed to be the first ever in the community that seeks to disentangle North Atlantic right whales, which migrate between Canada and the southeastern U.S.
"His death is a devastating tragedy, and those that knew him are in a state of shock. His loss will be felt in many ways," says a statement from the Anderson Cabot Center for Ocean Life at the New England Aquarium, which tracks and rescues right whales. While offering condolences to Howlett's family and community, NOAA Fisheries' public affairs officer Kate Brogan says the agency "is suspending all large whale entanglement response activities nationally until further notice," to allow NOAA to review its emergency response protocols. Brogan adds, "NOAA Fisheries and partners will continue to provide all other stranding response services to marine mammals in distress." As A.J. Higgins of Maine Public Radio reports for our Newscast unit from Bangor, "Whale rescuers and researchers at Allied Whale in Bar Harbor say they hope that NOAA will at least consider some whale rescue efforts on a case-by-case basis." On Thursday, Canada's Department of Fisheries and Oceans said it's immediately closing part of the snow crab fishing area where whales have been spotted. It also asked fishermen and commercial sailors to reduce speeds and share any whale sightings.